The Sharpshooter is a quarterly publication brought to you by the Oregon Society of Soil Scientists. The goal is to help keep everyone connected. You will find information about upcoming meetings, events from other organizations, what is going on at other soils related agencies, new research from students and professors, and some waxing poetic about soils. If you know of something soils-related going on in Oregon, send us an email and we will get it added to the next edition. 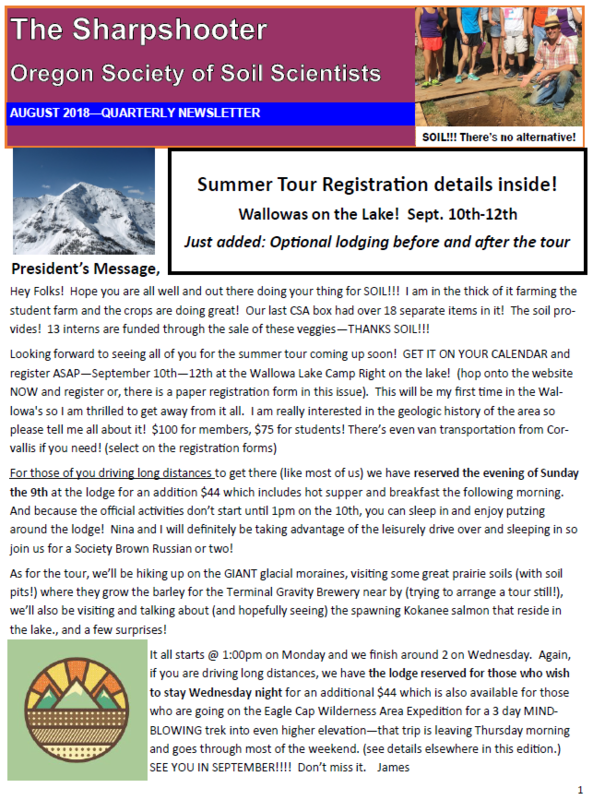 It is currently distributed by email to a full mailing list of soil scientists in Oregon. One time per year we send a printed copy to members only. To stay up to date, become a member or at least sign up for the mailing list. We are working on compiling as many of the old editions of the Sharpshooter as possible on our Archive page. Check out the history of our organization by taking a peak back in time. If you happen to have a copy of an edition not listed, please send it to us.